DEC's long association with youth conservation programs began in the 1930s with the Civilian Conservation Corps (CCC) and continues today with several AmeriCorps programs managed by the Student Conservation Association (SCA). Every year, SCA members work side-by-side with staff from the Hudson River Estuary Program and Hudson River National Estuarine Research Reserve measuring culverts, conducting school programs in classrooms and in the field, teaching people how to fish during I Fish NY clinics, planting trees and shrubs, and helping monitor tidal marshes. Ashawna Abbott, Aidan Mabey, and Martice Smith (left to right, pictured above) all caught the conservation spark as high school students counting "glass" eels in local tributaries for the American Eel Research Project. As educators for the Estuary Program, they became mentors and teachers in those same high schools, helping a new group of students discover the Hudson River. Ashawna led public canoe and seining programs, collecting fish and river insects. 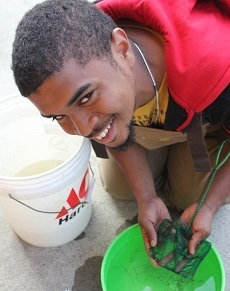 Aidan managed more than 500 volunteers sampling for juvenile eels from Staten Island to Troy. Martice taught lessons to students ranging in age from kindergarten through college, and taught people to fish during I Fish NY free clinics. All three helped classes collect fish and water quality data at several waterfront sites during A Day in the Life of the Hudson and Harbor. 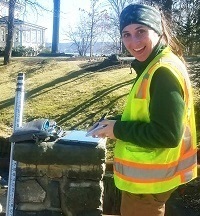 Erin Lefkowitz conducts field assessments of culverts and bridges where roads cross streams. This work helps identify where structural collapse, build-up of debris, or other problems create flood risks and form barriers to movement by fish. Erin also participates in community outreach efforts to promote the replacement of impaired crossings and assists the Trees for Tribs program. 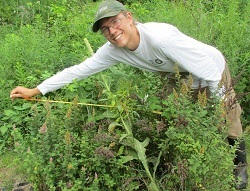 Alex Curtze is measuring the size of a shrub from a Trees for Tribs planting several years ago. Monitoring plant survival rates, health and size, sources of damage, and maintenance needs ensures that Trees For Tribs is creating healthy streamside buffers to habitat. 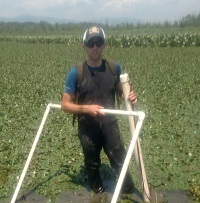 Russell Barbera has worked with the Hudson River National Estuarine Research Reserve updating sustainable shorelines case studies for Esopus Meadows Preserve and Water Trail and Haverstraw Bay Park. Russell took photos and collected data during site visits to document how the shorelines have changed since the projects were constructed. He also co-hosted two webinars for the Sustainable Shorelines Webinar Series.